How to choose the right marmalade recipe for you? There are seemingly countless ways to prepare seville orange marmalade and with the right group of people, this topic could lead to a rather long and heated debate. Some of it comes down to personal preference - do you like a fine, medium or chunky peel, would you prefer a low sugar jam if it means compromising the perfect set? But some of it also comes down to science and what constitutes a perfect marmalade. Here are some things to consider when looking for the perfect marmalade recipe for you. If you are lucky enough to live in an area where you can actually choose your Seville Oranges, consider yourself lucky ;). In previous years, I have been lucky enough to get my hands on organic sevilles and have noticed a couple of difference when using them to make marmalade. So if you are wondering if there are benefits to going organic over and above health benefits - there are! They definitely have better flavour and they set more quickly than non-organic. Overall leading to a higher quality marmalade. The fresher they are when you make your marmalade the better. Over ripe fruit tend to lose some of their pectin so you will have to cook your marmalade down too far in order to achieve set if your oranges are old. And you may not know this but Sevilles come in several sizes if you are buying them in bulk, this is a good thing to know. In Canada you can get 88, 72 or 56's. The smallest are the 88's and the largest the 56's. If you are following a recipe it is always a good idea to use one that goes by weight and not number of oranges as this can lead to varying results. There are so many different ways to prepare your peel and this is truly where personal taste comes into play. If you prefer a less bitter marmalade you can peel the skin off like would would an apple, getting as little of the pith as possible and shred it super fine or you can leave it nice and chunky. Just keep in mind the chunkier the peel, the darker your marmalade will end up as it will take longer to soften it. If you find a recipe you like the sounds of but want to alter how you prepare your peel, just keep in mind it may affect how long you need to cook it in order to soften the peel. Recipes vary and you will find as you comb through them, that some suggest you prepare your peels one day, soak them overnight and cook the marmalade on Day 2, while others have you do it all in one day. How do you know which is the better option? For me it is a simple answer. If you are looking to enter your marmalade into competitions you always want to follow the 2 day process. You will end up with a brighter marmalade that is more appealing from an appearance perspective for the judges. I also find, that when you split the tasks over 2 days it is a lighter workload on each day. But if you are pressed for time and you only have the one day available in your calendar to make marmalade, don't worry about it. You will still end up with a lovely tasting marmalade if you do it all in one day. Yes, recipes will vary on what type of pan you should be making your marmalade in. Some swear by the preserving pan, which is generally not lidded, has outwardly tapered edges and is quite often made of copper. While others will swear by using a pot with a lid. Why the difference in opinions and which route should you go? I have made marmalade both ways. With the open pan, (especially if it is copper just remember to not use it until you have added sugar to the mixture. Use a different pot to soften the peels) you will notice a high bitter note to your marmalade. You may also notice that the liquid in your marmalade evaporates more quickly and you end up with a higher concentration of peel to liquid ratio when jarring. 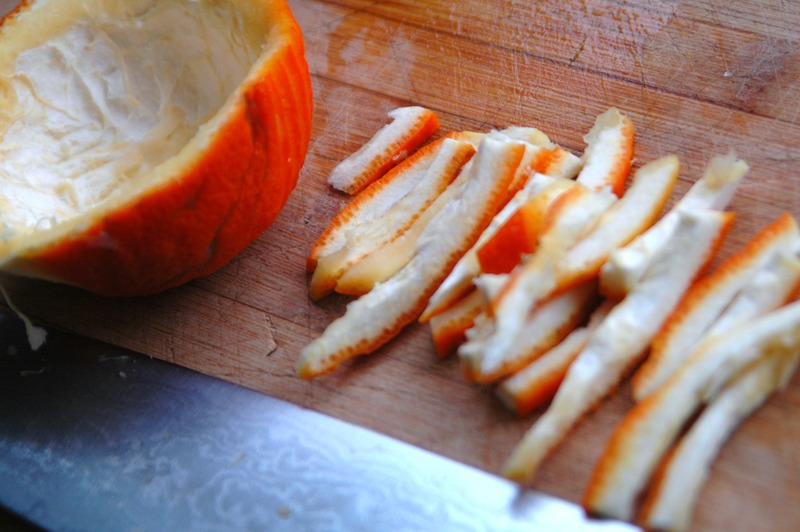 With the open pan method your peels also may lean towards a chewier consistency. The lidded pan obviously contains the evaporation which means it will not reduce as quickly. 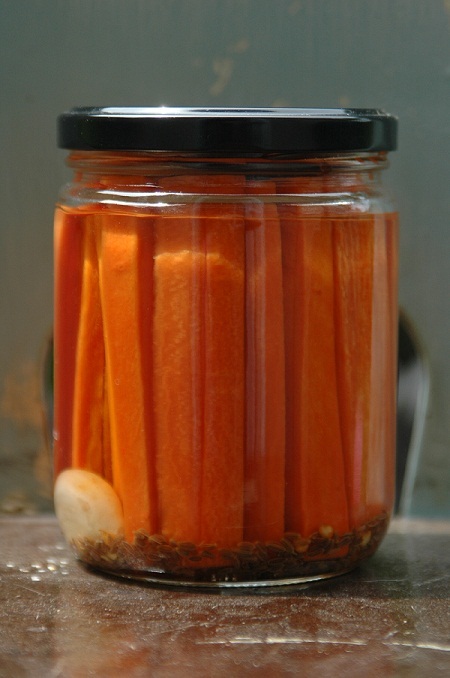 You will have a less bitter flavour and a lower ratio of peel to liquid when jarring. 5) How much sugar should the recipe have? There are wide swings in the amount of sugar stated in recipes that I have tried over the years. If you want a marmalade lower in sugar you will have to keep in mind that your marmalade will not achieve a proper set and will be softer in consistency. It will also have a shorter shelf life which means it most likely will not last you til next marmalade season. Personally, I prefer the spoon test. This gives me the closest relationship with the marmalade. This may sound strange, but I think this is important. When I can see the consistency of the marmalade beginning to change and I think I am getting close to set, I dip my spoon in every 5 minutes or so and check on how the drops are falling off the spoon. I find this visual way of checking gives me the ability to achieve the set I prefer. When you make your marmalade, do you slice the peel real thin? Do you zest it very slowly, or cut it while you grin? when you make your marmalade, do you cut the peel real fast? 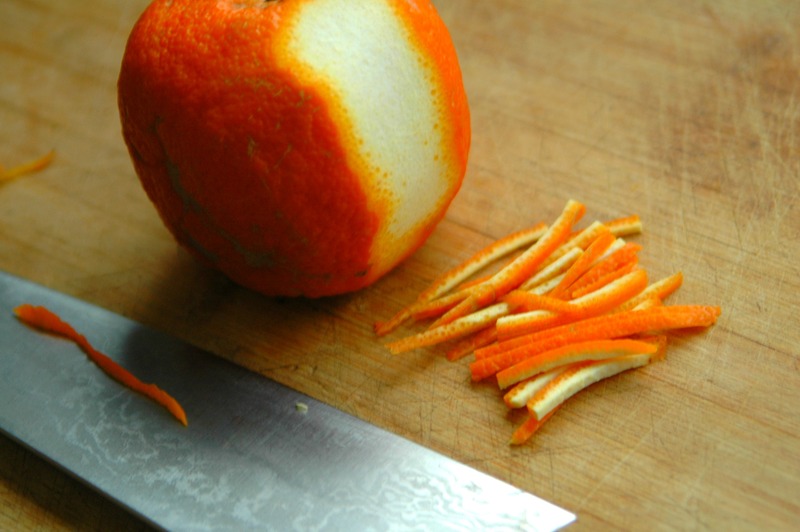 Medium Cut Peel - best obtained by juicing the orange and then removing all of the membrane from inside the peel, and then cutting into medium size chunks. Thick cut peel - best obtained by juicing the orange and then removing all of the membrane from inside the peel, and then cutting into thick size chunks. It seems to be right around this time of year when people start to hang up their Christmas lights, the days get shorter and the wind gets colder and I start to think about cranberries. There are a lot of great cranberry sauce recipes out there. Some of them add ginger or orange zest to the sauce to make the flavour more complex and interesting. What do you do to your cranberry sauce to make it stand apart? I can tell you what I do. I add roasted walnuts and pecans. 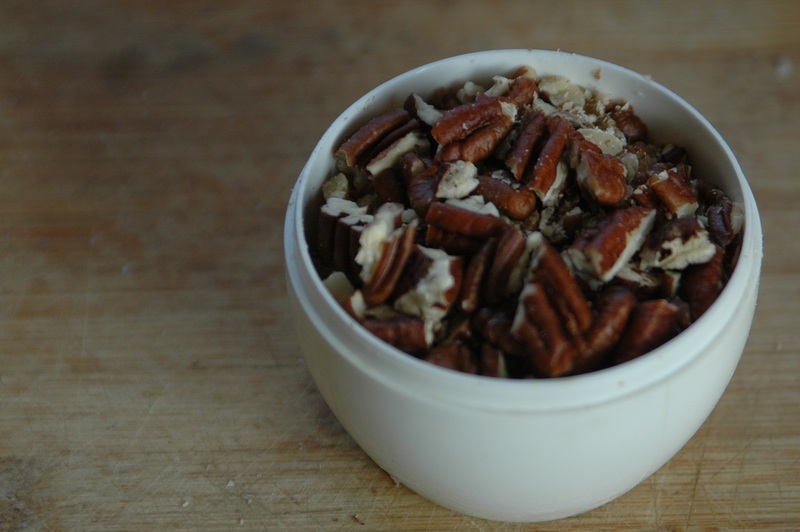 I take anywhere from 1/4 cup to 1/2 cup of a combination or walnuts and pecans and I chop them roughly and place them in a pan on my stove top over medium-high heat and stir them occasionally. Keep an eye that they don't burn. You want the nice flavour of the roasted nuts to permeate your cranberry sauce - not a burnt flavour. In about 5 minutes the scent of roasted nuts will be evident and they will have turned a golden brown. Prepare your sauce as per your normal instructions and add the nuts close to the end of the cooking time. Delicious! There are two ways to process preserved fruits and vegetables, but how do you know when you need to use one method over the other? When can you safely water bath something versus having to pressure can it? There is a simple rule - fruits and HIGH acid foods can be safely preserved using the water bath whereas vegetables and LOW acid foods are what NEED to be pressure canned. Now don't go confusing pressure canners with pressure cookers or steamers, or it may result in some exploding jars, contaminated product or worse. Pressure cookers and steamers simply will not heat the contents of your jars to the correct temperature, so be sure you are using a pressure cooker and follow the operating instructions that you will find inside the box. 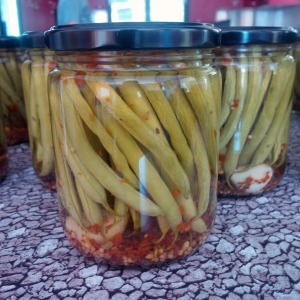 Pressure canning increases the temperature of the product inside your jars to a hot enough temperature that it kills and bacteria present and will also deactivate any unwanted enzymes. So what types of items are considered LOW acid? Once you have chosen the correct sized water bath canner/pot for the job, follow these simple steps to complete the water bath process. Put your rack on the bottom of your canner and fill with water, leaving as much as 4 inches of clearance from the top of the canner. If you notice mineral deposits beginning to form on your processed jars, you can add vinegar to the mix to prevent this. Using a jar lifter, place each of your sterilized and filled jars into the canner and ensure it is sitting flat on the rack within. Leave space between each of the jars to ensure water continues to circulate between the jars and heats jars evenly. Bring the temperature of the water up to the level required for your recipe and begin timing the water bath. Ensure the temperature maintains at a minimum the temperature outlined in your recipe and increase heat if required. When the time is complete, remove the jars from the bath and place on a cooling rack or tea cloth. Never place your hot jars directly onto your countertop or they could shatter. Allow the jars to cool and then store in a cool, dark place. Place the pressure canner on your stovetop over low heat and bring the temperature to 180F. Increase your heat to medium-high until steam begins to escape. At this point, set your timer for 10 minutes. After about 4-5 minutes your gauge should show that you have reached the desired pressure. Set your timer for the amount of time outlined in your recipe. Ensure the pressure does not drop throughout the entire process. If it begins to drop, increase your heat. remove the jars from the canner and place on a cooling rack or tea cloth. Never place your hot jars directly onto your countertop or they could shatter. - if the pressure drops during the process for less than 5 minutes, increase your heat until pressure has returned to the desired level. Add 10 extra minutes to the time remaining in the process. - if the pressure drops during the process time for more than 5 minutes, increase your heat until the pressure has returned to the desired level and re-process for the entire time outlined in the recipe. There is nothing more disappointing than when a jelly doesn’t set or your jam separates or pickles or preserves float or change colour. Don’t take it as a personal failure! There is a lesson hidden in the jar and once you learn what caused this particular batch not to turn out the way you liked, you are one step closer to making the perfect batch the next time. With that in mind, here are some tips to help you make the perfect batch of jam every time. Jams, jellies and marmalades are all made from a balanced combination of four ingredients and the correct proportion of each of these in relation to the other is required to achieve the right set. You will release way more liquid from the fruit this way than if you were to cut or chop by hand. Always remember not to double recipes to increase yield. They may fail to set and potentially separate as they cool. Always check the expiration date on the pectin and follow the instructions for its use carefully. What tips or tricks do you have for the perfect batch of jam every time? Crestfallen…that is how I felt when I woke up this morning. When I walked into the kitchen and picked up the 125ml jar of what was supposed to be Beer Jam but is still simply beer liquid, I felt my heart drop. I knew that the people who attended my Prosecco Jelly (which turned out beautifully) and Beer Jam class last night at The Depanneur would at some point come to the same realization when they checked the jars they brought home last night. I sat down with a bit of a thunk at my kitchen table, rested my head in my hands and mentally ran through the list of reasons why a jelly doesn’t set so that I could diagnose the situation. Not enough acid. We used the juice of 1 lemon as the recipe called for and I watched Gwen squeeze the life out of that lemon. Acid was not our problem. 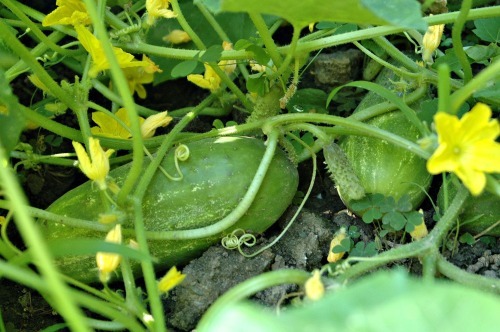 Overripe fruit. There was no fruit in this particular jelly unless you consider Guinness Beer a fruit, so I knew I could cross this one of our list. Not enough pectin. We used the prescribed amount of pectin. Not enough pectin officially crossed off the list. Suddenly it came to me in a flash and I ran to my Rubbermaid container with the supplies from the class last night and dug out the box with the pectin used in the beer jelly. EXPIRED. KEY LEARNING: Always, always, always check the box for the expiration date before using it. The good news for those in the class is that you can still use what is in the jar. It is not a total waste. Just bring it to a gentle simmer in a pan until it begins to thicken up and use it as a syrup or marinade. But as anyone who knows me will attest, this really bothers me. For those in my class (and I am going to try to reach you via email) who would like a jar of the Beer Jam that they got to taste at the beginning of the class, just drop me a line. I will whip up a batch and drop some off at The Dep for you to pick up. I hope that the skills you learned in the class will still prove handy and that you will have the confidence to try this recipe again at home!